For the past three decades, Miuccia Prada has had an incredible influence on fashion. Season after season, she presents collections that Prada fans all over the world can’t get enough of – and ultimately, that trickle down to influence the way people dress all over the world. Often branded as an “intellectual designer” (a term she hates), her continuing legacy is impossible to ignore. Beyond Prada, there is, of course, Miu Miu. Originally started in 1992, her subsidiary line of womenswear sought to express a younger spirit. 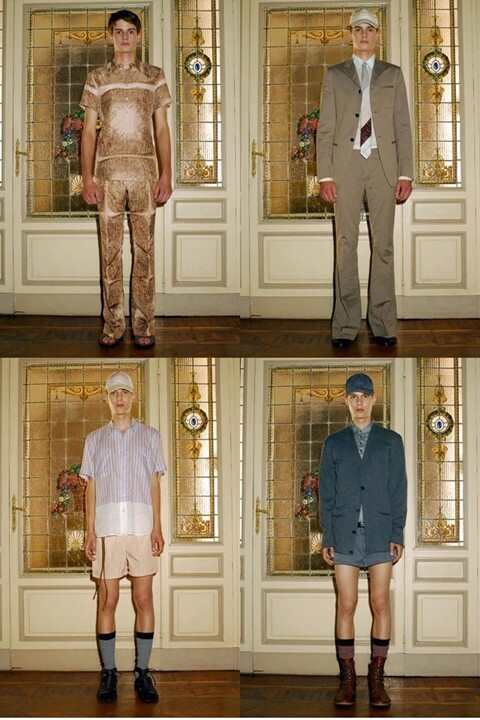 What you might not know, if you weren’t around at the time, is that there was also a line of menswear under the Miu Miu label. That’s right, Prada’s little sister brand – known for its Women’s Tales, its young actress campaign faces and its total obsession with off-kilter girlishness and femininity – also had a little brother way back when. In the early 00s before the increased focus on pre-collections, Mrs P was one of the hardest working designers in fashion and presented eight collections a year – four for Prada, and four for Miu Miu. 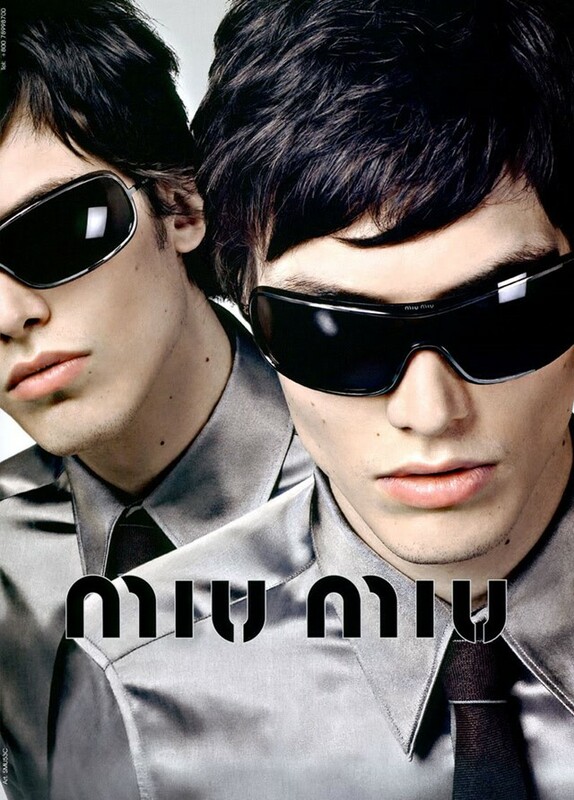 With a design team boasting the likes of Stefano Pilati, from 1998-2000 (before his appointment at YSL), Miu Miu menswear was pretty much the dream for fashion-obsessed men. If you’re wondering why you weren’t aware of it, it’s because the menswear line sadly closed in 2008. Now, ten years later, we remember some of its highlights. While Miu Miu womenswear made its runway debut in 1992 (three years after Prada) the menswear iteration didn’t debut until 1999. Following a presentation for spring/summer, that was essentially a menswear capsule of the womenswear, the AW99 show was the first standalone collection on the catwalk. “A wider group of people, and even more young people, are increasingly understanding design in clothing,” Miuccia told the New York Times in 1998 on why she wanted to create the menswear diffusion line. “We like sophisticated things in fashion and in art, but that's why we like young people, because they are the ones that bring up new ideas,” echoed her husband and chairman of the brand, Patrizio Bertelli. More simply put, “We’re not elitist,” he said – a sentiment that is still true of the house today. At a much more affordable price point, at the time Miu Miu was 50 per cent cheaper than Prada. The AW99 collection itself began laying the foundations of what the line would become, and was mostly made up relaxed tailoring, with functional utility belts slung around the models’ waists. Paired (of course) with ugly shoes – all looks that (honestly) wouldn’t look out of place if they were presented on the runway today. As is the case with the men’s and women’s line for Prada, the two sides of Miu Miu often informed each other. While the collections weren’t shown together, as they often are nowadays, there was often a common thread running through both. “It’s light and free. Not serious. Age is not really fundamental; the spirit is more important than age,” as Miuccia often says about the difference between Prada and Miu Miu, and for menswear, it was no different. Before the kitsch motifs that populated the menswear mainline (if you’re not familiar, the recent AW18 collection brought back some of the best) Miu Miu was the outlet for Mrs Prada’s playful side. “The 80s for me is an obsession,” Miuccia told Susannah Frankel for the spring/summer 2006 issue of Another Man about her repeated referencing of the decade in the collections. Miu Miu’s menswear boys had the same sensibilities of his older Prada brother, but with a naïvety and spirit of youth. Think tailoring in more relaxed silhouettes, and retro graphic-print shirts. “Sometimes it makes me quite angry that I have to be so banal,” Miuccia explained to Frankel about her approach to design. She did also experiment with and occasional embellishments, and fun accessories like bucket hats, logo-branded belts, and artsy ties. Before Willy Vanderperre (who currently has a five-season streak of campaigns) Mrs P enlisted a variety of photographers to shoot the ads for the line. Among them were longtime Prada collaborator Steven Meisel, Mert & Marcus, Horst Diekgerdes, and Norbert Schoerner. Perfectly complimenting the collections, the campaigns often had amazing backdrops – a tropical greenhouse for SS99, contrasted with a glass-floored skyscraper for AW99. Or more simply in a studio to highlight the retro-future vibe. Drawing more parallels between the menswear and womenswear, the images for both were often shot in the same locations until the mid-00s when they finally came together as one enviably-dressed couple. There were many highlights throughout the lifespan of the label – unsurprising when you consider the genius that is Miuccia Prada. 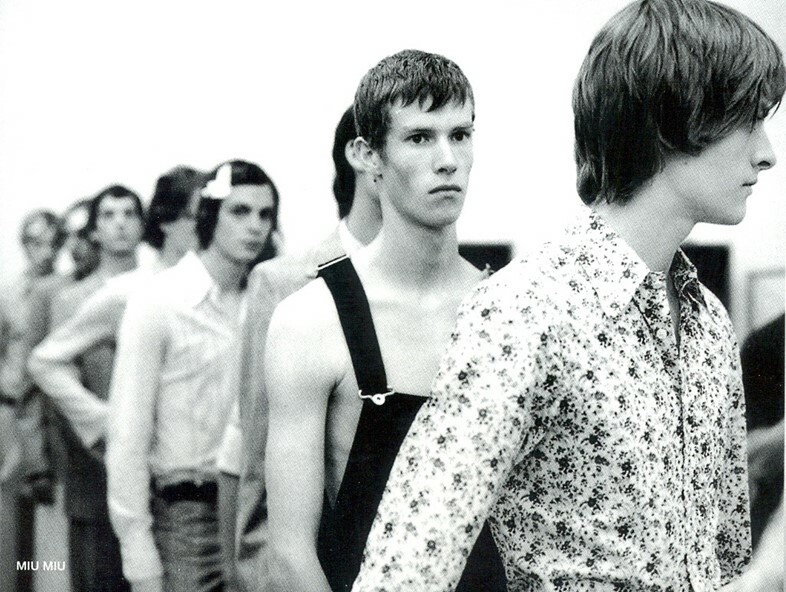 Among them SS05, that could have been Mrs Prada’s nod to stoners – featuring trippy prints and mushroom motifs. Not to mention the first Prada banana on the front of a sweater, long before the SS11 collection made it into a signature. For AW06, Miuccia referenced the Tyrolean style of dress she grew up wearing, in a more sombre collection that was made up mostly of herringbone tweeds, military silhouettes, and knits in muted colours. There was still the youthful attitude brought with the coat-of-arms silk shirts, and giant studded hiking boots. On a dark purple carpet runway, the AW05 collection was probably the most mature. As is typical for Miuccia, she chose to work with suede (a fabric she said she hated, but grew to love) keeping in mind an idea of the male equivalent of the bourgeois-lady she presented for the women’s line. With some amazing outerwear – leather, suede and duffle coats – the pièce de résistance were the chain belts, that looked as if they were a nod to those first used by Coco Chanel. They were actually dog leads. At the time, WWD reported that the parent company wanted to focus on the women’s side of the label – as it had doubled its profits in two years. No doubt aided by the move to Paris for the AW06 show, leaving the menswear behind in Milan. While it wasn’t announced that the line would end until after the collection, the last collection was not a sombre one and, in fact, was probably the best celebration of what it represented. Like a teenage boy, dressing up for his first formal event, the collection featured suiting with flared trousers worn with baseball caps. Elsewhere prints appeared in matching pyjama sets. And yes, there were socks worn with sandals. 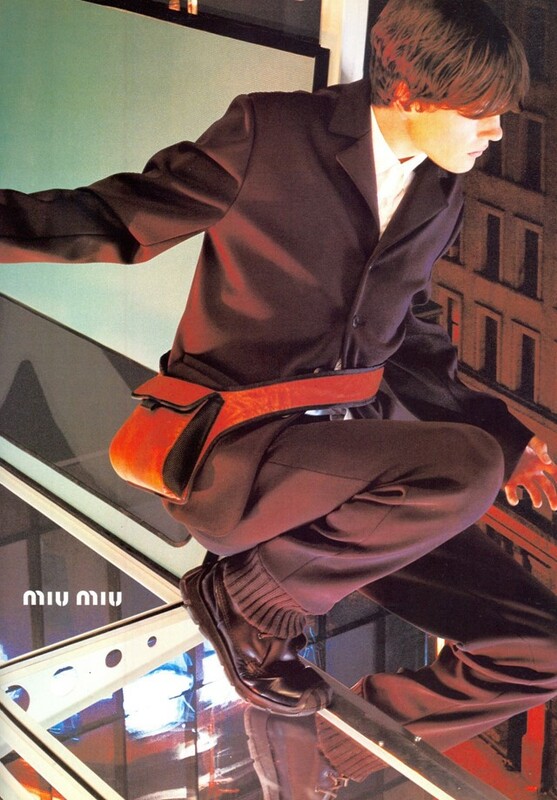 Just like its lack of presence on the internet (seriously, pre-internet era fashion is difficult to find), you’d be hard-pressed finding any traces of Miu Miu menswear that you can still buy. On resale site Vestiaire Collective there is a modest offering of more basic items like coats and shirts, with must-have pieces like the SS05 embellished graphic face shirts, or mushroom-print sweaters quickly snatched up. Although highly unlikely after 10 years of being shuttered, maybe Mrs Prada will answer all of our prayers and bring the line back from fashion’s graveyard. There’s certainly a gap in the industry for it. With contemporary menswear catering to one of three groups – streetwear, traditional tailoring, or those sticking a middle finger up at both – there isn’t a brand epitomising all of the qualities of Miu Miu menswear: youthful but refined, playful but considered, and ultimately very chic.